"The world changed today. What I say or do is very minor compared to the significance of what happened to our country today when it was attacked." So said Expedition 3 Commander Frank L. Culbertson, upon learning of the Sept. 11, 2001, attack on the World Trade Center. 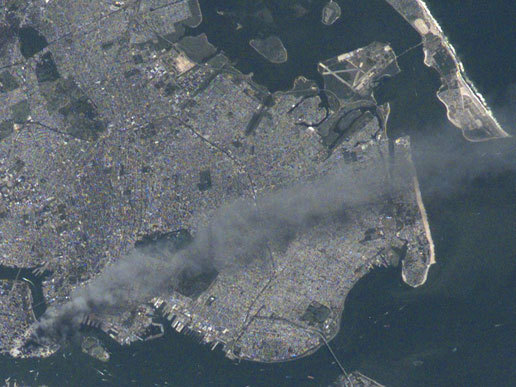 This image is one of a series taken that day of metropolitan New York City by the International Space Station's Expedition 3 crew that shows the smoke plume rising from the Manhattan. Upon further reflection, Commander Culbertson said, "It's horrible to see smoke pouring from wounds in your own country from such a fantastic vantage point. The dichotomy of being on a spacecraft dedicated to improving life on the earth and watching life being destroyed by such willful, terrible acts is jolting to the psyche, no matter who you are."